The Center has a well-established base of collaborative community partners which includes other community-based organizations that provide a broad source of referrals. We promote, foster, and contribute to the healthy development and growth of teens, and families, through education, support and advocacy; responding to the changing needs of adolescent teens and families in our community. Our services provide an environment that encourages social, individual growth, and development for youth, serving ages 8-18 and their families. Each participant will be assigned a case manager for encouragement, support of their goals and to assistance in accessing resources that will help at-risk teenagers and their families navigate school and community systems, helping them to access support resources to help them be successful. The program is designed to meet both the short and long term needs of the family and is a powerful combination in reducing the risk of substance abuse, family conflict, in addition to offering parents guidance and support with their teens that are diagnosed with mental health issues. Focusing on parenting issues and family wellness, The Center is committed to working with local parent and community organizations to bring parents print and video information, parent networking opportunities, and educational workshops. Our ultimate goal is to provide strength- based techniques so parents are equipped with the tools to strengthen their abilities to raise their children. To meet the challenges of adolescence with confidence, parents require clear information, practical strategies and support from those around them. Parents need current information, presented in a clear and accessible format, about the normal developmental tasks of adolescence, along with facts concerning tobacco, drug and alcohol use; depression; suicide; sexuality; and other particular topics of concern. They also need to know where to find specialized services directed to their particular needs, or to those of their teens, and how to gain access to such services. Parents need to learn strategies and techniques for handling common problems (schoolwork, household chores, peer relationships, family relationships). The types of skills that prove useful are effective communication, setting limits, defining responsibilities, enforcing consequences, negotiating, problem solving and managing anger. To put the information and strategies they learn into practice, parents need support and encouragement. Their confidence may be shaken if their teen becomes argumentative and uncooperative; they may even feel embarrassed by their teen's rebellious behavior. When parents feel inadequate, their authority is undermined and they are less effective. Parenting courses provide a support group. Even reading a good parenting book or watching a video can reduce feelings of isolation. The programs and other resources found in the following sections all provide information that parents need, as well as opportunities to practice effective strategies. As for support, participants in parenting groups regularly report "It helped to hear that other families are dealing with the same issues. I don't feel so alone." Addressing multiple topics that concern parents through workshops, conferences, enrichment programs, and parenting networking opportunities. Publishing an online parenting newsletter that addresses current issues facing families. Case managers who coordinate services that help at-risk teenage children and their families navigate school and community systems, helping them access support resources to help them be successful. Psycho–social education programs for adolescent teens. Most parents will agree that communication with their child is an important part of their relationship. Being able to communicate with your child will create a healthy bond within the family and allow for an environment in which your child will thrive. Somewhere around age 13, however, this communication may become challenging. Developmentally, children change physically and emotionally in early adolescence. Along with these changes comes a need and desire for more independence, which may translate into less communication and less family interaction. Parents often struggle with these changes and the communication gaps that begin to emerge, resulting in parents’ frustration and lack of comfort while talking to their child. When parents feel pushed away by their teen, it is very important that they not take it personally, but instead modify the way that they communicate with their child to fit their new needs and capabilities. 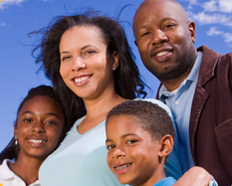 Although your teen is asking for independence, he or she also still needs the structure and connectedness that family can provide. It is important that parents maintain the structure of the household, communicate their expectations of their child, and encourage children to communicate with their parents.